The Jeep Hoist-A-Top is a must have for Wrangler owners. 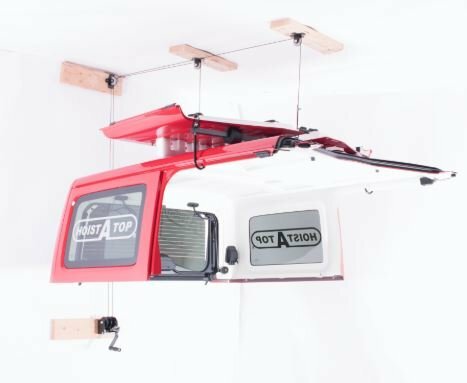 The new Hoist-A-Top makes removing and storing a hardtop an easy, one -person job. The Hoist-A-Top supports any top with a well-balanced steel frame using the new Balance Blade. Rubber coated hooks and foam-covered hardware will protect your top's finish. The Lange Hoist-A-Top uses an incredibly strong steel powder coated frame that quickly attaches to your vehicle top without any drilling. The rear Smart Hook allows you to lift and store your hardtop with the rear window closed which will improve the balance as well as take up less storage space. This model also stores your freedom top pieces up and out of the way, with your back window closed with the patented smart-hook. With the turn of the wrist this hoist will lift your top to the ceiling in your garage or carport for convenient, out-of-the-way storage. 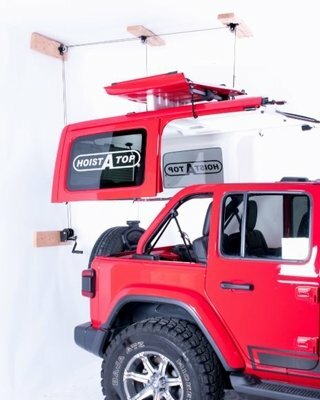 Hoist-a-Top uses an incredibly strong steel frame that quickly attaches to your vehicle top. There is nothing to drill or attach to your top. 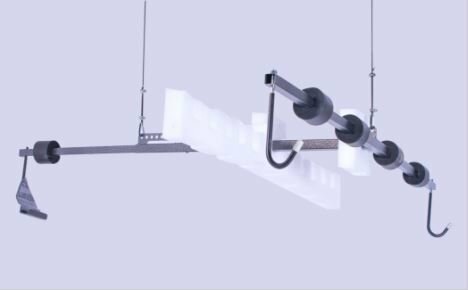 A specially designed cable pulling mechanism then lifts your top to the ceiling in your garage or carport for convenient, out-of-the-way storage. It takes only about three minutes to remove your top, by yourself. Replacing it is just as easy. Hoist-a-Top is a complete turnkey system. Installation is simple and their custom systems come complete with excellent installation instructions. No more pulled muscles, strained backs, dropped or damaged tops, or pinched fingers. Best of all, you don't have to find a group of people to help every time! Hoist-a-Top is available with a manual or power lift. A Hoist-a-Top Power Unit upgrade is available for owners of the manual Hoist-a-Top that want the convenience of a power lift. 2018 JL Jeep Wrangler 2-Door Sport, Sahara, and Rubicon. Ceiling Height 7-20 ft, with room to park your Jeep.